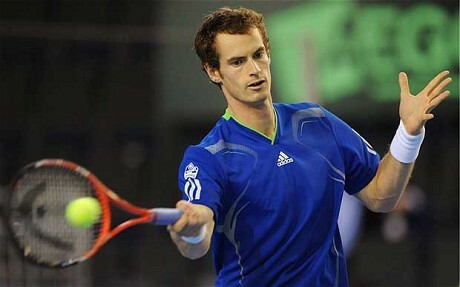 The tennis starâ€™s threat to lead a playersâ€™ revolt is unlikely to elicit much public sympathy. If nothing else, the picket line would be entertaining. As Andy Murray threatens to don a donkey jacket and lead top tennisâ€™s professionals out on strike, Rafa Nadal, Novak Djokovic and Roger Federer are right behind him. He is deadly serious, he says, and has convened his fellow baseline militants to a meeting next month in that hotbed of radicalism, Singapore, to decide their next move. How lovers of the absurd will hope the strike of the millionaire sportsmen materialises. The prospect is too delicious of centre courtâ€™s Arthur Scargill taking up position outside the All England Club, firing aces at any scab who attempts to gain entry, while shovelling Â£50 notes on to the brazier to keep warm. Murrayâ€™s beef is over the crowded nature of the tennis calendar. We may, in this country, think the game is restricted to Wimbledon fortnight. But the fact is that every day there is a tournament somewhere in the world involving the more marketable players. 19th-century mill workers were financially exploited too. And public sympathy is not high for a bunch of workers whose idea of oppression is being paid several million pounds to engage with a game the rest of us have to pay to play. This is always the problem with sporting strikes; Bob Crow would enjoy greater support aboard the 8.15 from Orpington on the day before a national rail dispute than any sportsman who plays the industrial action card. Yet angry disputes between player and payer have been around from the moment those involved in sport first sought remuneration. In 1909, the Professional Footballersâ€™ Association was formed in a Manchester pub and immediately called its members out on strike. The Football Association responded by instructing clubs to lock out the disputatious players. The chief shop steward was Manchester Unitedâ€™s Billy Meredith, renowned for strutting his stuff on the pitch while chewing on a toothpick. Meredith, a master of public relations, organised for the striking United lads to be photographed in a park looking resolute as they gathered around a sign reading â€œThe Outcastsâ€. But, then, sportsmen donâ€™t have the job of the miners. How much easier is it for a trade union leader to haul his members out of miserable underground conditions than it is to persuade them to stop knocking a ball about in the fresh air? Not that it has stopped some from trying. Leading players in both the Italian and Spanish football leagues made noises about going on strike this season. And who can forget the efforts of the footballer Gary Neville who tried to foment a strike in the England dressing room 95 years after Meredithâ€™s strop. Red Nevâ€™s stoppage, however, stalled before it began â€“ largely because the root of his anger, the FAâ€™s ban on his colleague Rio Ferdinand for missing a drugs test, was hardly the most persuasive of causes. Murray might find the well of sympathy from tennis followers is similarly shallow. Especially when those who pay his wages realise that most of his tournaments are played under the jurisdiction of the Association of Tennis Professionals. Tennis, it turns out, is a business in which the workers have longed owned the means of production. Which means that were he to succeed in bringing the lads out, Murray would be organising a strike against himself.